Following temporary unavailability, Microsoft’s new Surface Studio is back in stock! Pre-orders currently available, but won’t ship until early 2017. Just a few days after the official presentation on stage, Microsoft’s new Surface Studio was listed out of stock in the Microsoft store. On the Microsoft Event held in New York City on the 26th of October, this new device was presented to the public and quickly impressed the professionals with its features, design, and creative class. It took nearly an hour to Panos Panay to introduce the capabilities of Surface Studio – its performance, innovative functionalities, and stylish design. But what really made an impression about this device and immediately turned it into a very attractive must-have machine was the display. Its 28-inch PixelSense display is really a huge step towards the desktop and touch technology. The quality of the graphics is incomparable to other devices. Moreover, it allows any professional to express its creativity without any limits. All of them were listed out of stock in the Microsoft Store yesterday. The Pre-orders began on October 26th itself, and it seems that the interest for Surface Studio was so huge that all the available devices were sold out. Of course, having in mind the impressive introduction, this was expected to happen. Luckily, today the pre-order option is available again. It seems that Microsoft is acting fast in adjusting its inventory and manufacturing orders to respond to the customers’ interest. 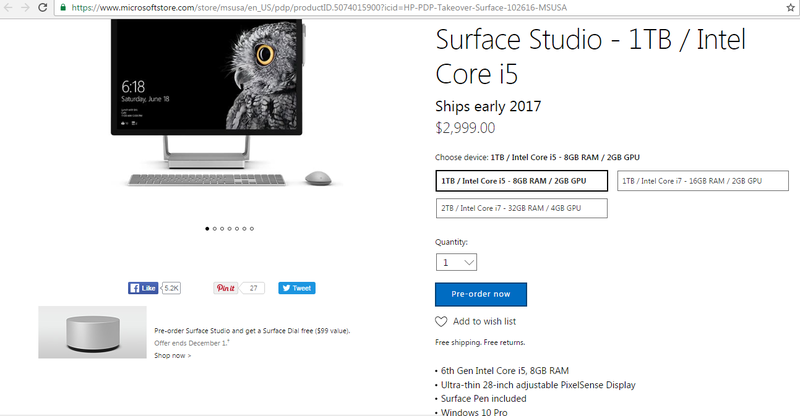 The first owners of Surface Studio may expect the Core i5 variant for shipment earliest in December and the Core i7 versions are scheduled for early 2017. Twitter was down, but now back online! Microsoft’s Groove Music Maker – Apple’s GarageBand competitor?